This is a double wedding ring appliqued quilt by Valerie. With all those curves, you can imagine the challenge of getting everything to lay down flat. Her cornerstones are also oversized to the traditional pattern. This would make the non applique version of creating this quilt even more challenging to the point of impossible. I love the colors. The black, white, and gray with that pop of yellow, gives this traditional design a real modern kick. She quilted this with and all over edge to edge paper pantograph pattern called Cadence. It has some nice swirls and fleur dy lys. I think it adds a nice detail that can be seen in the white negative spaces of the quilt. This was also a quilt top from Valerie. I believe she made it with shirts of a passed loved one. It is an orange peel design completed with applique. What a fun design for a memorial quilt. After taking the Breaking into Free Motion class with me (which I’ll be teaching again in May! ), she wanted to free motion quilt this quilt. In that class we talk a lot about echoing and outlining. She used those skills she learned in class to create this elegant custom quilting design. Outlining can sometimes be difficult to quilt even and exact. So rather than outline each piece, she echoed them an inch or so to the inside creating a melon rib. Then she added another echo to the outside of the appliqued pieces including a loop towards the center. This made a lovely little flower shape inside the negative space. Beautiful design does not need to be complicated. This is the last one by Valerie (for this post at least). This baby quilt is an original design by Valerie for a family member. 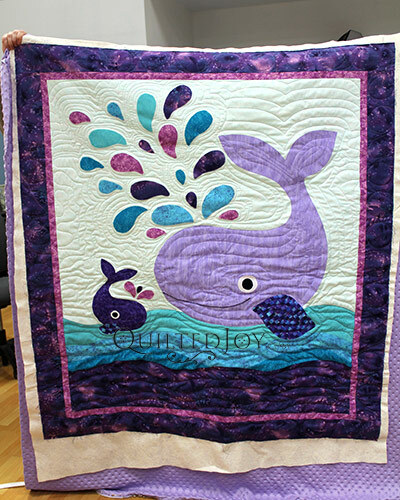 The mother loves whales and wanted to decorate the nursery with them. So Valerie found a coloring book picture that she liked and drew it out larger to create her own applique pattern. Coloring books can be a quilter’s best friend. Valerie used free-motion quilting to complete this quilt as well. She simply outlined and echoed all her pieces including echoing into the center of her whales. Super simple and super effective. Nancy made this beautiful batik applique quilt. It is kind of hard to tell, but she cut the hearts from a crazy pieced batik fabrics. After appliquing the hearts to white squares, she then alternated those blocks with nine patches. The resulting Irish chain with hearts is amazing. I especially like the triple border and hot pink backing. This photo doesn’t allow you to see the amazing cute pantograph that she added to it. It was hearts of course, just a Whole Lotta Love paper pantograph. Applique can be done by hand or machine. There are multiple types of adhesives that can make it even easier. You can leave the raw edge of the fabric exposed, completely cover it with a satin stitch, or just turn them under. There are so many ways you can applique a design on a quilt, that I’m sure you can find a method that will work for you!